Continued contraction in private sector activities followed preceding report of falling retail sales in February. Will the HK50 advance continue? Hong Kong economic data have been weak recently: retail sales recorded 10.4% decline over year in February following 6.9% growth in January. 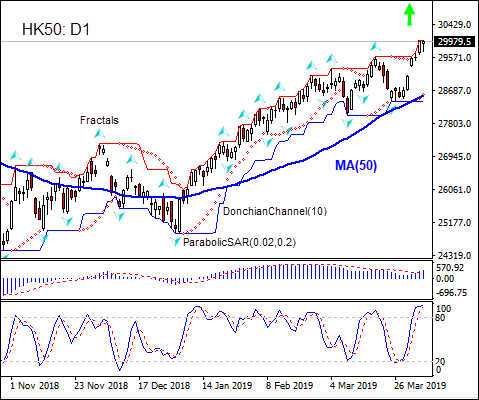 The Nikkei PMI decline to 48 in March from 48.4 in February indicated the contraction in the private sector continued: above 50.0 indicates sector expansion, and contraction below. Slowing of activities is due to deteriorated US-China trade relations, where a progress in bilateral talks was qualified as “ninety percent of the deal is done, but the last 10% is the hardest part ” by a US Chamber of Commerce executive ahead of Vice Premier Liu’s visit this week to Washington to continue negotiations. However technical indicators point to upside momentum for Hong Kong stock market. The unresolved US-China trade dispute remains a downside risk for Hong Kong stock market. On the daily timeframe HK50: D1 is rising remaining above the 50-day moving average MA(50), which is rising too. These are bullish developments. We believe the bullish momentum will continue after the price breaches above the upper Donchian boundary at 30010.0. This level can be used as an entry point for placing a pending order to buy. The stop loss can be placed below the lower fractal at 28400.5. After placing the pending order the stop loss is to be moved every day to the next fractal low, following Parabolic signals. Thus, we are changing the expected profit/loss ratio to the breakeven point. If the price meets the stop-loss level (28400.5) without reaching the order (30010.0) we recommend cancelling the order: the market sustains internal changes which were not taken into account.